These Crème de Menthe squares are a dream to enjoy. Have them with coffee or tea, alone or with a friend. Makes a wonderful hostess gift for a special dessert treat. The special combination of mint and chocolate will please every palate. 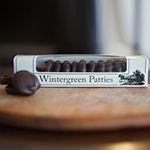 Each box contains 7 ounces of Crème de Menthe squares, handmade the old fashioned way by New England's Ye Olde Pepper Companie, using original recipes dating back over a hundred years. 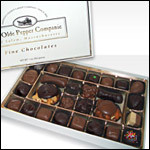 The candy starts with only the finest ingredients, all cooked in small batches in copper kettles over open-fired gas stoves. The Ye Olde Pepper Companie kitchen has for many years has been acclaimed for its superior quality and rich taste the world over.